I dont know if you follow the VA markets much, but if you look at months of inventory, DC usually falls in line with Arlington & Alexandria. 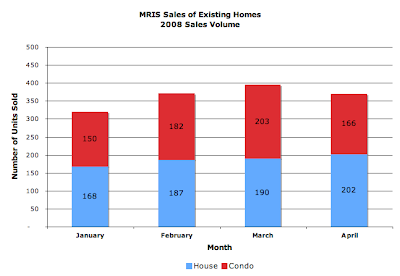 Back in January, due to poor sales all 3 areas were flirting with double digit months of inventory. 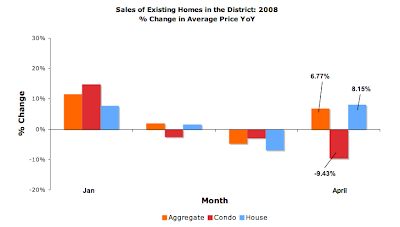 Arlington & Alexandria have knocked those numbers down significantly in the last 4 months and are now at 5.37 and 6.02 months of inventory (respectively). By contrast, DC has not improved since January, and has in fact gotten slightly worse (9.51 mos vs. 9.83 mos today). Do you have any idea what is causing this in DC (i.e. why does it look like its breaking away from Arl & Alex)? I personally have no idea why, but given that you follow DC more closely than I do, I wanted to see if you had any guesses. Feel free to speculate away. 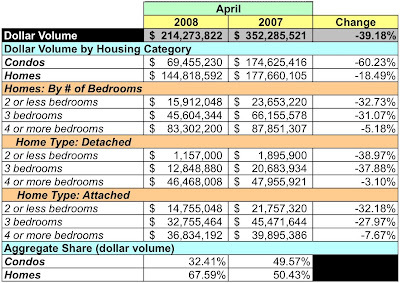 I love your analyses of the data, but I disagree that condos are in "free fall." If you look back to your trends for 2007, e.g. the plot here, you can see that there was an odd fluctuation upwards for condo sales prices last April. The 9% YoY drop therefore has little significance, unless there is some reason to believe fluctuations should be correlated every year. (There isn't of course.) 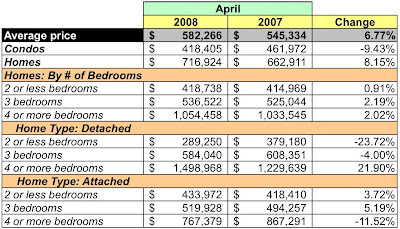 The average sale price of condos in April 2008, $418k is in line with the March and May 2007 prices of $399k and $416k, respectively. 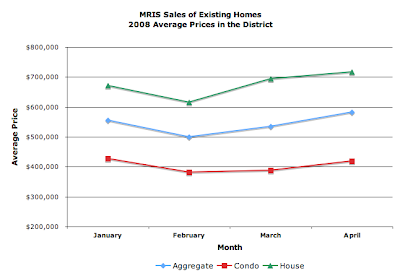 So, condo prices seem to be basically flat in the district. The problem with MRIS' data is lack of granularity so that one cannot account for sales that might skew the overall results. That is, while prices may be flat YoY, the impact of the three condos that sold for $1-2.5MM, out of the 166 sold, may have a disproportionate impact on the average sales price. Worst case, those three might represent more than 10% of the total dollar volume. If one accepts that and discounts them from the analysis, then the average condo price would be about $380K, $80K less than the same period last year. What isn't open to debate, I would hope, is the number of units sold, on which I based my "free fall" statement. When I said "free fall", I was referring to the fact that 329 condos were sold in April 2004, 347 in April 2005, 300 in April 2006, 378 in April 2007 and in April 2008, 166. In other words, this was the worst April for number of units sold in four years. This past April had about half the sales volume of any of the previous 4.